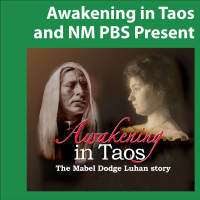 The release version of the award-winning documentary Awakening in Taos: The Mabel Dodge Luhan Story is narrated by Academy-Award nominee Ali McGraw. Tony Lujan’s Great Grandson Blue Spruce Standing Deer will perform live Taos native music. Michael Kamins, Executive Producer, as well as other producers, cast and crew will join Mark Gordon, Director/Writer, and Ali McGraw at the screening which will be followed by a Q & A. Updates to the release version include additional newly-restored historic photographs and paintings reproduced courtesy of the Georgia O’Keeffe Museum. Filmed in Taos and Santa Fe, with an all New Mexico cast and crew, Awakening in Taos will be broadcast over New Mexico PBS stations beginning on February 28 at 7 pm. Awakening in Taos recounts the personal life journey of Mabel Dodge Luhan, an independently wealthy writer, salon hostess, art patroness, and social activist. In 1917 she moves from Greenwich Village New York to Taos, New Mexico and finds discovers the home she has been seeking – magical, untouched, luminous. She falls in love with and marries Antonio “Tony” Lujan, a full-blooded Tiwa Indian from Taos Pueblo in a time when this was revolutionary. Inspired by the native culture and distinctive landscape of Taos, New Mexico she invites many well-known artists, writers and social activists to Taos, forever shaping the character of the region. She was responsible for bringing Georgia O’Keeffe, Ansel Adams, D.H. Lawrence and many others to New Mexico. It’s a story about the search for love, spiritual inspiration and personal freedom. The film features stunning cinematography of Taos landscapes and landmarks by Bob Willis. These physical features of the landscape produced a school of painting that evolved over the early twentieth century. The film explores paintings and photos major artists, some of whom were guests of Mabel and her husband, Tony. Mabel’s influence extended into the world of arts, music, literature, women and Native American rights and activism. Her concerns about equality and social justice remain poignant today. In this present age of environmental crisis and social evolution, the time has come to reawaken the issues for which Mabel Dodge Luhan campaigned with her heart, mind and soul.